Through social networking, the average consumer likes and shares their opinions and interests in what they deem credible and newsworthy for everyone. Social media has created a space where opinion and news has become intertwined which may be why it is so popular, users are creating pockets of the internet to spread personal influence. According to Pew Research Center, over 75 percent of college students use different types of social media including Facebook, Instagram, and Snapchat as of Jan. 2017. Students and social activists have become involved in online media by spreading their personal gospel and even creating news. As individual content creators we are creating trends, criticizing politics, and informing our peers on community issues. Henry Jenkins, American scholar and professor employed by the University of Southern California and contributor to the MIT Technological Review commented on social uses of the internet in 2003. “This is what a lot of us had hoped would happen in the digital age: the technology would put low-cost, easy-to-use tools for creative expression into the hands of average people. Lower the barriers of participation, provide new channels for publicity and distribution, and people would create remarkable things,” said Jenkins. Despite media creating these remarkable things, the largest problem social media faces is that there is no way to verify whether a source is credible or not. “I don’t think the majority of people are responsible enough to disseminate relative information, hence the constant sharing of fake news,” said student Janet Curiel. 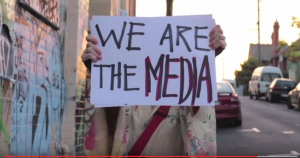 “I definitely believe that we are media, whether it’s through the internet or broadcasting. We can communicate almost anything through social media,” said graduate student Lana Elyo. The hashtag was made popular by a social activist and musician Amanda Palmer in 2012 to fund her album on Kickstarter in opposition against the mainstream music industry. The beauty of social media lies in the access and transparency; though social media is often glorified there are many negative as much as positive aspects that affect the public. Social media is a personalized tool that has the ability to do both great and terrible things with constant growth and expansion we can only guess how current social media use will influence the future of media.